Here's a video collection of Typhoon Mario floods that hit Metro Manila and nearby areas on Friday, which caused people to leave their homes. As of 2 p.m. on September 19, the National Disaster Risk Reduction and Management Council reported that widespread flooding occured in the National Capital Region due to continuous rains which started on Thursday. 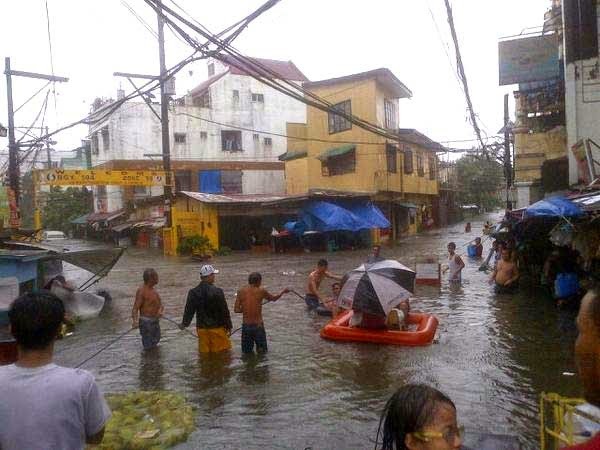 The NDRRMC said over 104,000 families or more than 470,000 individuals were affected by the Typhoon Mario floods in Regions 3, 4A, 4B, 7, and NCR. Of the total, over 10,000 families are inside 63 evacuation centers and more than 1,200 are outside the evacuation centers. As of early Friday afternoon, the agency said a 2-year-old girl, identified as Althea Gaviola from Bagong Silang, Quezon City, has been reported dead due to drowning. A total of 78 flights were diverted and cancelled, 8 international and 70 domestic, respectively, the NDRRMC added.